Happiness Manager. Chief of Culture. Dedicated culture team. Are these all just shiny new names for the same old things? Or are they signs of a new and much-needed way of thinking about the people who drive a company? For the Barcelona branch of Magento ecommerce software, these phrases are real-life examples that illustrate how they’re building a culture worth investing in. Today you’ll hear directly from their Kaizen Team — three agile coaches and an HR manager — on how you can cultivate a culture of trial and error and autonomous decision-making at your company as well. Agile and Scrum are popular project management methodologies, but they tend to be relegated to the software department. 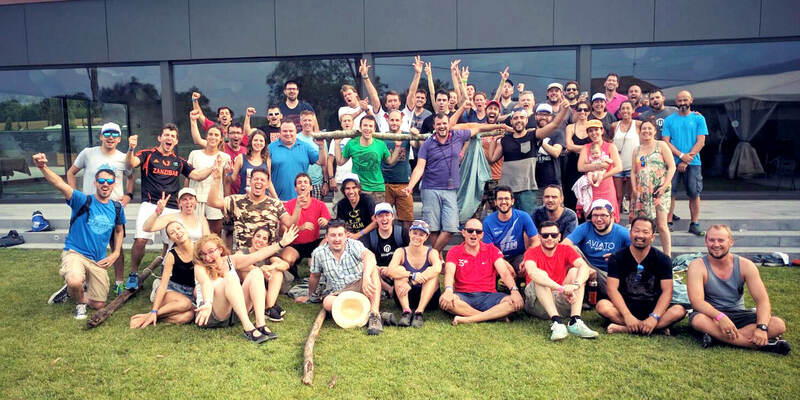 After they began their agile and Scrum transformation in 2013, the Barcelona branch of Magento discovered they had two cultures coexisting in the office: agile collaboration and the old-school standard-issue office culture. Now the Kaizen Team is bringing the Japanese business philosophy of continuous improvement to the whole office, including fraud protection, HR and accountants. And while a lot of agile project management is associated with saving time and money, for this team, it’s most focused on developing culture. But besides breaking work into smaller projects with faster deliverables, what does it mean to have a culture that’s driven by an agile approach? The team is very flat with an emphasis on self-organization. At this Magento office, decisions are made collectively. While exciting and innovative, agile-inspired management isn’t always easy. Debates and decision-making can drag on. The members of the Kaizen Team try to facilitate these conversations to speed things along. To help clarify the concept of self-organizing, the Barcelona office uses the Delegation Board. A positive secondary effect has been avoiding the “you were supposed to do that, not me!” finger-pointing that can come with self-organization. It’s a tool to visualize who does what — and, more than that, who decides what. A “one” on the scale means the boss has all the say, a “seven” means the team is completely autonomous, and a “four” means a group decisions. As you can see in the image below, the vast majority of decisions are sixes (team makes the decision and informs the rest) and sevens. The process of embracing transparency has been a journey. Fabio calls this part of the “magic” of what they do. Once a headcount is approved, each small team is in charge of hiring their own members. But they need extra insight into how their processes comply with legal guidelines, which is why they brought on a local HR expert. When the Barcelona team to hire an HR manager, they didn’t assign her to work with other admins. Instead she joined the trio of agile coaches, while also joining Magento’s international distributed human resources department. Andreia Leite Silva says her interview with the three agilists was “very interesting” — and not a standard interview. It didn’t touch on her strengths and weaknesses. And she didn’t have to repeat back what was written on her resume. Coming from more traditional companies, where managers decide “two percent here, five percent there,” she was surprised but intrigued. This grassroots-level engagement also relies on continuous employee feedback. The Barcelona Magento team uses HappyForce, an anonymous feedback platform that helps measure happiness (or lack of it) at work. Andreia says they use this tool so people can easily respond each day with their mood: awesome, good, meh, or not very good. Teammates can comment anonymously about what they like or don’t, then others can vote up or down on the comments. “It’s a way to sense how people are doing in the office. You don’t have to wait until the end of the year for the satisfaction survey. Anyone can use it and anyone can try to solve things,” she says. “We do a lot of feedback initiatives so people feel comfortable to share and hear other people’s thoughts and to give them freedom to add feedback, to give voice to people,” Toni adds. “When you have a very flat structure, it’s not obvious or easy sometimes to make decisions and to put initiatives forward, and you want to make people comfortable to come forward and speak. Collective decision-making and transparency aren’t a breeze, but they have an incredible effect on the culture in this office. Most of all, the team values the opportunity to be able to experiment with different practices and share what they learn. The next time you’re involved in a decision with your team, step back and look at it with an objective eye. Are there ways that you could bring greater transparency or participation to the process? What parts of your startup culture do you try to export? We’d love to hear more! Tweet to @RedboothHQ and @JKRiggins! Jen is an enthusiastic Luddite in the world of tech, loving that storytelling and marketing let her truly understand and share the benefits of SaaS, APIs, and the Internet of Things. Originally from New Jersey, she collaborates globally and is based in London. Find out more about her work with tech startups at eBranding.ninja.